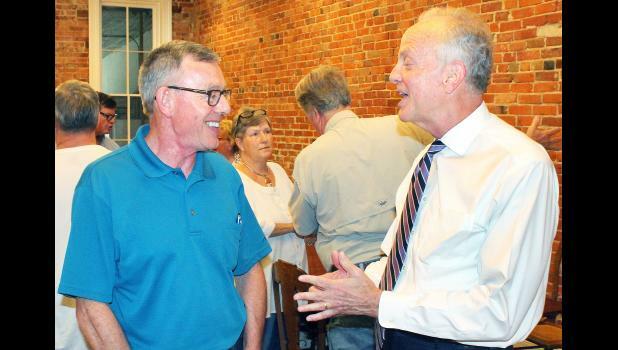 Civility — whether it concerns the role of the United States in world trade in the face of recent tariffs or the tone of political discussions across the country — is an essential element in bringing people together, U.S. Sen. Jerry Moran said Saturday morning during a stop in Holton. “There are people who just want to fight, and while there’s nothing wrong with believing firmly and strongly in something and arguing in favor of it, the end result must not be wanting to fight, but to convince people and come together to solve a problem,” Moran told an audience of about 20 at the Hot Spot in Holton as part of a listening tour of Kansas’ 105 counties. The Republican senator addressed a variety of topics during his hour-long visit, focusing on international trade, veterans’ issues and agricultural matters, as well as whether states’ rights take precedence over federal law. But, he added, there must be a certain level of civility involved in making and debating policy, both at home and abroad.